What is Cruciate Ligament Disease? The stifle/knee joint is a hinge joint, involving the femur which articulates with tibia and fibula below it. Between the femur and tibia/fibula there are two cartilagenous structures called menisci that act as shock absorbers when stress is applied to the joint. The entire joint is held together by ligaments, which help it move in the correct direction smoothly. There are two cruciate ligaments, they are called the cranial and caudal cruciate ligaments and they prevent inappropriate forward and backward movement of the femur in relation to the tibia. The collateral ligaments prevent any unwanted side to side movement of the bones relative to each other. This is the term used to describe damage or injury to the cruciate ligaments, and damage can be either a partial tear or a complete tear/rupture. It tends to affect the cranial cruciate ligament. 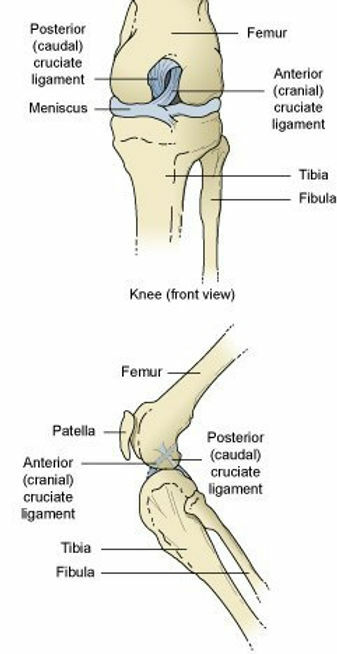 Injury to the cruciate ligament leads to instability in the joint, allowing the femur to move forwards over the surface of tibia leading to pain, discomfort and inflammation. The constant movement and trauma to the cartilage surface of the bone and menisci leads to lameness, which is often non-weight bearing in the dog. How does cruciate ligament injury develop? Generally it is associated with some sort of trauma such as slipping on a floor, jumping over a fence, falling from a height, jumping off a sofa. In older dogs it may be naturally weakened and more prone to damage. Larger, overweight and older breed dogs tend to be affected, but it also seen in smaller breed dogs. What are the signs of cruciate ligament disease? In sudden on set cases, the dog tends to become suddenly lame on a back leg and is reluctant to put full weight on the leg. This is often referred to as ‘toe-touching’. Chronic cases tend be associated with a gradual onset of lameness and change in gait. Heat and swelling may also be associated with the joint. How is cruciate ligament disease diagnosed? Initial diagnosis is made based on history and clinical examination. If the vet is concerned that your pet has damaged a cruciate ligament further tests will be advised, including assessment of joint stability under sedation or general anaesthetic and imaging (x-rays) of the affected joint. X-rays are important as they allow the vet to assess if there is any evidence of arthritis in the joint, which may affect the long-term prognosis and approach to management of the case. Mild cases and small breed dogs may be able to be managed conservatively and may include one or all of the following – anti-inflammatory medication, controlled exercise program, body weight management andphysiotherapy/hydrotherapy. However, if the cruciate disease is determined to be severe then a variety of different surgical options are available which your vet will discuss with you. This is were a prosthetic ligament is placed around the outside of the stifle joint. It therefore stabilises the joint and allow normal movement to occur again. Return to normal movement can take an averagy time of 2-3 months, and it may take several weeks before your dog will want to put weight on their limb. All animals go home with pain killer, an exercise program and are advised to start supplement such as glucosamine and chondroitin sulphate. Hydrotherapy is also highly recommend to aid recovery. These are complex procedures which involve altering the geometry of the joint so that movement of the femur down the tibia is limited and the cruciate ligament is no longer required. Return to normal walking tends to be quicker with this surgery and anti-inflammatories, a controlled exercise program and physiotherapy/hydrotherapy will also be advised. As with any surgery success is not guaranteed and complications may be develop. The factors outlined below increase the risk of a problem post-operatively. Temperament – rest post-operatively is encouraged and this can be difficult in very active/bouncy dogs. It is important to note that dogs with cruciate ligament disease often have arthritis already present and may require a long term management plan.